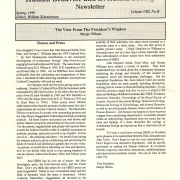 We digitized a few HBES Newsletters of years 1996 to 1999. They can be retrieved (in PDF) from the Society’s website. https://www.hbes.com/newsletter-archive. Robert Kurzban chose to step down from his position as President of HBES on April 26. He is also on leave as Editor-in-Chief of the Society’s journal, Evolution and Human Behavior. HBES members have received an email explaining these changes. Past-president Elizabeth Cashdan is Acting President until the meeting in Amsterdam and Debra Lieberman is Acting Editor-in-Chief of the journal. Please send your nominations to Mark Flinn (flinnm@missouri.edu) by 15 February. Make sure that anyone you nominate is an HBES member and is willing to serve. And for those you nominate, please inform them if they are chosen to be on the official ballot we will need a biosketch of no more than 300 words and a link to their personal or academic webpage. After the nomination closing date, the Election Committee will present the election slate to our Executive Committee for approval. We plan to open the on-line election on 1 March and close it 21 March, 2017. Results of the election will be announced at the annual meeting in Boise, Idaho on May 31 – June 3, 2017. Apologies for the recent influx of spam on the website, including the anouncements page. The HBES website ws hacked, but I’m sorting it out now. Please disregard the recent email about HBES 2016 Registration; this was sent in error while I was removing the hacked edits.